This pattern comes from The Stoney Creek Cross Stitch Collection January-February 2000 Volume 12, Number 1. 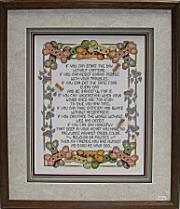 The pattern displays a verse about some dog bone wisdom surrounded by dog bones and dog prints. With Supplies: $30.44 You download the design. We will send you, 24 skeins of DMC Floss & Wichelt 14ct. 18" x 21" Aida (White) to complete your project.